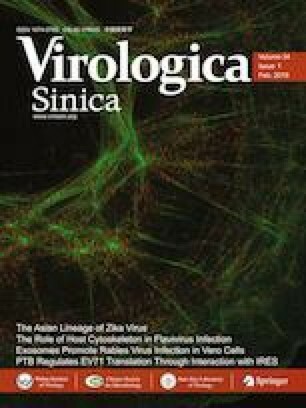 Tripartite motif (TRIM) proteins were shown to play an important role in innate antiviral immunity. FinTRIM (ftr) is a new subset of TRIM genes that do not possess obvious orthologs in higher vertebrates. However, little is known about its function. In this study, we used bioinformatic analysis to examine the phylogenetic relationships and conserved domains of zebrafish (Danio rerio) ftr01, ftr42, and ftr58, as well as qualitative real-time PCR to examine their expression patterns in zebrafish embryonic fibroblast (ZF4) cells and zebrafish tissues. Sequence analysis showed that the three finTRIMs are highly conserved, and all contain a RING domain, B-box domain, and SPRY-PRY domain. In addition, ftr42 and ftr58 had one coiled-coil domain (CCD), whereas ftr01 had two CCDs. Tissue expression analysis revealed that the mRNA level of ftr01 was the highest in the liver, whereas those of ftr42 and ftr58 were the highest in the gill; the expression of these finTRIMs was clearly upregulated not in the eyes, but in the liver, spleen, kidney, gill, and brain of zebrafish following spring viremia of carp virus (SVCV) infection. Similarly, the expression of these three finTRIM genes also increased in ZF4 cells after SVCV infection. Our study revealed that ftr01, ftr42, and ftr58 may play an important role in antiviral immune responses, and these findings validate the need for more in-depth research on the finTRIM family in the future. Wanmeng Liu and Ming Kuang have contributed equally to this work. The online version of this article ( https://doi.org/10.1007/s12250-019-00112-5) contains supplementary material, which is available to authorized users. This work was supported by the National Training Program of Innovation and Entrepreneurship for Undergraduates of Huazhong Agricultural University (2015308200403), the National Key Research and Development Program of China (2018YFD0900505), the Natural Science Foundation of China (31172433), and the Fundamental Research Funds for the Central Universities (2662018YJ022). LX, LW and KM conceived the project, wrote and revised the manuscript. KM performed the experiments. LW, KM and ZZ did data analysis. LY, LX checked and finalized the manuscript. All authors read and approved the final manuscript. All animal procedures were conducted strictly in accordance with the recommendations of the Guide for the Care and Use of Laboratory Animals of the National Institutes of Health. All the animals used for viral infection were not endangered or protected species. Zebrafish were employed in in vivo experimental tests under the approval of the Animal Ethics Committee of Huazhong Agricultural University (HZAU). The infection and dissection experiments were performed under anesthesia with 3-aminobenzoic acid ethyl ester methane sulfonate (MS-222) (Sigma, USA) to minimize suffering in the fishes.